Most of the puppies have now left our household. Cooper (black girl) is now living in Germany and Scout (black co-owned girl) in Belgium. The last ones to leave have been Murky (black boy who was Akseli/Tempo) to France and Orka (black boy who was Oslo) to Portland USA, Tenly (brown girl who was Pipari) to Pennsylvania USA and Mona to Georgia USA. The last (black) boy Kasper (affectionately known as TNT "Tente") is still with us because of an unfortunate cancellation and is being trained and socialized by us. We are looking for a permanent home for him, all the while getting more and more attached to the little darling :-). And our co-owned (brown girl) Joki is living with us a part of the week, while a part with her family :-). Here is a little story of Bettina's wonderful USA trip to Oregon, living with Orka's owners Leska and Lynn. After packing and finishing off paperwork with Annina all Sunday evening (and night), on Monday morning Bettina left for the airport with Annina, Virva-Riitta and of course our three flying pups Tenly, Mona and Orka. The ride only took 15 minutes as we live very close to the airport. During the car ride we got more and more excited about the upcoming jouney. At the airport we happened to bump into our newfie friend/breeder, who has one of her pups living in Portland – what a small world, of course I was more than excited to meet her pup on my trip :-) ! Tenly and Mona had been booked to travel in a crate as cargo on American Airlines (airline suggested by other newf breeders, and now also suggested by us for flying puppies :-) !). Orka got to travel with me in the cabin despite the long journey and his weight, as he is/was a service dog in training. 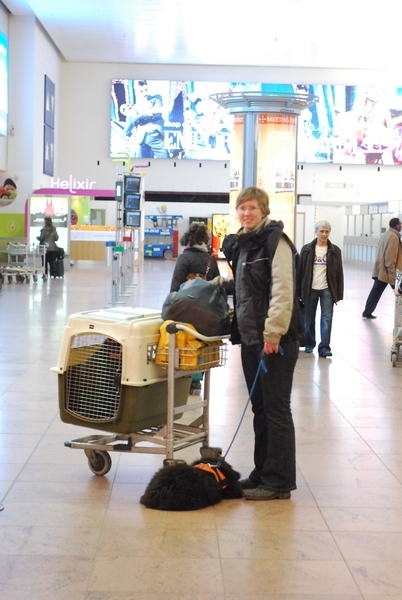 The puppies' papers were all in order, so I said goodbye to Annina and Virva-Riitta, and walked through the passport control and security checks to the gate to wait for the flight with Orka. The first flight was from Brussels to New York JFK airport (8,5hours), where Tenly joined her family :-). The flight to NY went very well: Orka slept the entire flight like a baby, not getting upset about any of the loud noises the airplane made. At New York, I checked the crate out and Mona and Tenly got out to streach for a bit. As I was changing the absorbant puppy pads, I noticed that the puppies' crate was still dry and there was still a bit of ice in the water bowl! (We had frozen about 2 litres of water for both pups for the flight as we knew that if the water was not frozen it would have been played in and spilt during the first five minutes of the flight.) Both Tenly and Mona peed on the puppy pads after we took them out from the crate at NY for a little stretching. Tenly's owners were very glad to finally meet Tenly. After a short while, Mona had to be checked back in (at this airport they actually put the empty crate through an X-ray machine and walked the puppies through the scans). After Mona was safely escorted to the cargo area, I and Orka headed for the gate. Again, Orka behaved like a gentleman and settled at my feet and dozed off for the flight. This second flight was only 6,5 hours to Seattle. The flight went very well again. The flight attendants made sure before leaving (as at Bxl airport) that the dogs were actually with me on the flight. When I walked off the plane in Seattle with Orka, there was an assistant waiting for me to help me with the dog. Of course as Orka was exhausted from the trip and all the walking at the airport (long distances!) and I was exhausted in carrying him all around, I got into the wheelchair and they pushed me to Leska who was waiting outside :-D. After that we headed to find Mona and her crate :-). She was very happy to see us :-). After getting the crate into Lynn's car, we headed straight for a closeby park to let Mona and Orka walk and wonder around for a while, and of course eat some food! They were both very hungry (I had only given them a handful of kibble at NY, so they wouldn't have to do number two during the flight. The day preparing for the flight, we had given them a lot of fatty meat and tripe to make sure they had enough energy even without getting much to eat during the flight). They both ate everything, and happily dozed off in their crate. We got to Oregon City (where Leska and Lynn live) after midnight on Tuesday morning. The first real day in USA was of course a doggyday buying a lot of interesting toys at the HautDauge warehouse nearby. Chris was very nice to let us explore around and show us through their selection. Even Orka and Mona enjoyed the stuffed grunting hedgehog -toy and of course their favorite empty binbags which they found under a shelf ;-). We bought a lot of interesting stuff including a few Nina Ottosson toys, a bumper, a few stuffed toys, activity toys and of course toys that make interesting sounds including a bird that tweets, a moose that makes a crinkling sound etc. Here I am at the warehouse thinking it's like Christmas :-) ! After the HautDauge we left for a pizzeria (where I unfortunately realized how young I am – no, they won't sell (the famous local) rootbeer to under 21's !) and then to a national park for a walk. On the way there we saw quite a few Christmas tree farms! Yes, they farm christmas trees!! Unbelievable :-)! Unfortunately by the time we got to the national park it had already gotten dark and it was raining, so we only went in to feed the pups. There were a lot of friendly deer at the national park, which were not even tiny bit startled by us walking right by them (only 5 meters from them). Wednesday early morning we left for Mona's flight. It was scheduled to leave around 9am, so we had to be at the Portland airport a few hours ahead of time to make sure all the paperwork was in order and that she would be ready to go. When we got there that morning, they told us that Mona's early morning flight had been cancelled! We managed to book her on the next evening flight, getting her to her family in Atlanta the next morning on a direct Delta flight. So we got to enjoy her an extra day :-). We headed for breakfast, a few retail stores and then to a dog park for the pups to socialize and of course play together for a while. Unfortunately there weren't very many dogs there that time, but we met a few. 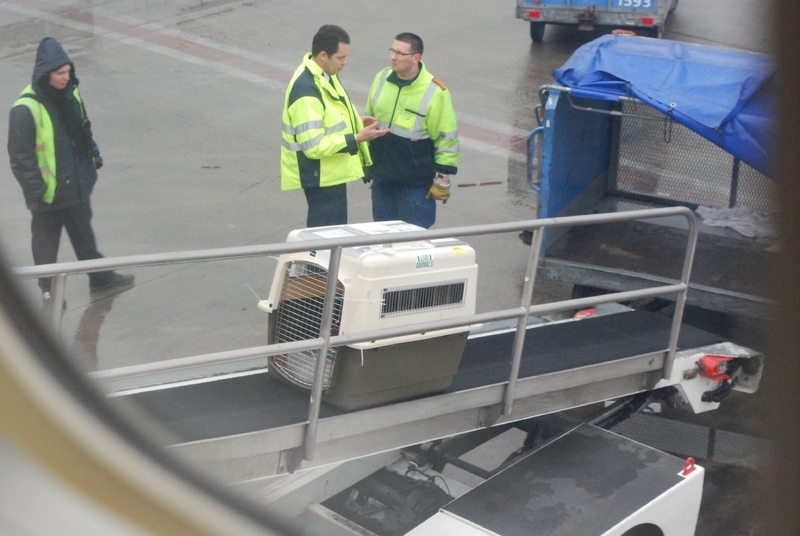 When we walked into the cargo office that evening, I nearly got a heart attack from the cargo officers who welcomed us into the office with “no pets today, the morning flight left already”. Oh my! Luckily it was just a joke on their part to spruce up their evening shift :-). I walked Mona up to the office, tied her to a chair letting her wait a while, while I carried the crate in with Lynn. It took her less than two minutes to drag the chair to the other side of the desk and to get to know and have a sniff at the officers more closely :-). 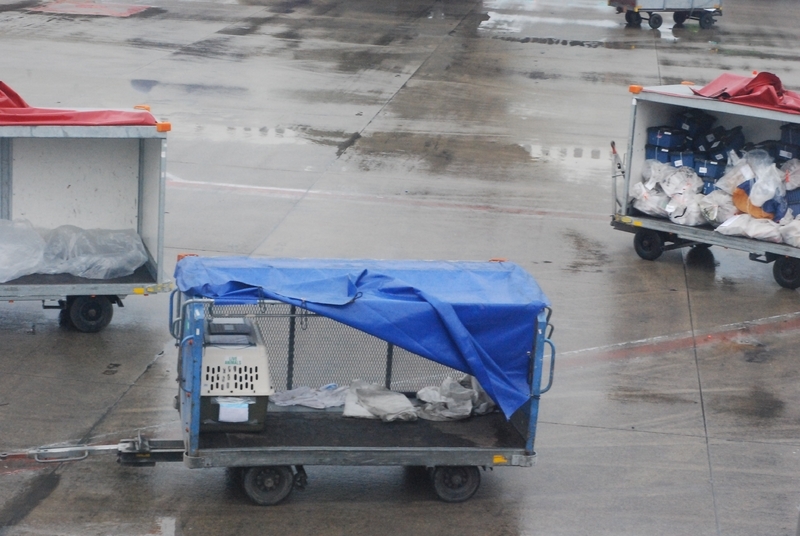 She walked into the crate happily, was weighed (51lb with the crate), her paperwork checked and was left there with the friendly staff to wait for her flight to leave. A few hours later she was greeted by her owners in Atlanta :-). Thursday we decided to leave empty, so that we could finally have a breather and of course let Orka relax at home and sleep! It was a well needed break. In the evening we headed to a dog training school called Puparazzi. It was great to get to see the advanced obedience and freestyle to music -classes. The trainers were very good with the dogs (using positive reinforcement methods) and going there confirmed that it is definitely the place for Orka to start his puppy socializing and – training classes. One thing I learned from that trip, was the command “touch”. Of course I had read about touch pads, but never really got the idea of why they would be useful in everyday obedience. But now I know and I think I will actually teach it to ours :-). Friday we headed to get to know the veterinarian, recommended by many newf owners and some newf breeders. He was very friendly and seemed to know what he was talking about. Only the best for our pups :-)! I got the shock of my life at the vet when Orka was weighed – the scale showed 40 on a 12 week old puppy!! Though of course they were in pounds, not kilos :-) ! After taking Orka back home with Leska, Lynn dropped me off at the world's biggest bookstore: Powell's. It was a whole two-storey block of ceiling-height tightly packed book shelves full of BOOKS. Anything and everything anyone would be interested in. I of course headed straight for the dog books and (animal) behaviour -books. I browsed through all they had and walked out with two big bags full of very interesting ones. Now I just have to figure out when I'll have the time to read all this ?! Looking forward to it though :-)! For the weekend, we had planned two newf get-together meetings at the dog parks. It was extremely nice to see so many dog friendly places (and off-leash parks!) in the Portland area. And, at every dog park, there were dozens of dogs, all playing well together :-). I was also surprised to see how many different breeds there were: anything from Irish Wolfhounds to Rhodesian Ridgebacks :-). The boxers that we saw had very nice long muzzles, nothing like what I'm used to seeing in Europe :-). Saturday we went to the Mary S. Young off leash dog park where we headed for the muddy lagoon with Oliver the newf. Sunday we went to the Sandy River Delta – huge off leash dog park where we met Gritt, Jane and Caron with their newfies: two black girls, one gray girl and one black boy. Unfortunately some had to head back home early, but Orka enjoyed himself bathing in the sun (and escaping into the shade!) with the other newfs. Caron was especially nice to talk to, having similar thoughts to mine about training and newfies in general – hope we stay friends :-). 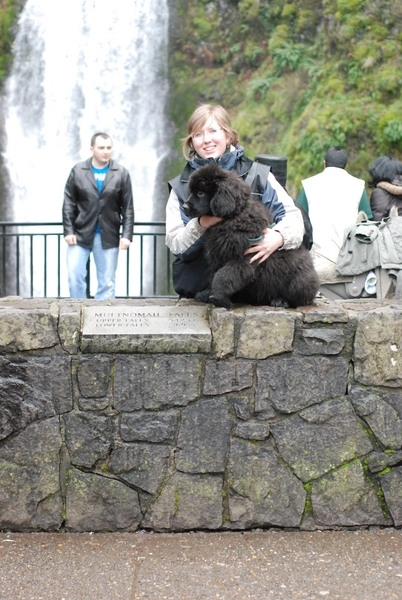 After the Sunday's newfie meet we headed to Multnomah Falls and to see the Gorge. It was amazing. I think the pictures tell more than a hundred words – so I do not need to describe it to you – how gorgeous it was there :-)! Monday was going to be an easier day again, so we headed to Mary's Wood's retirement centre (where Lynn works). Orka behaved extremely well: loved the petting and attention he got from the patients and of course the staff. He was calm and looked like he had been doing therapy work for years :-). 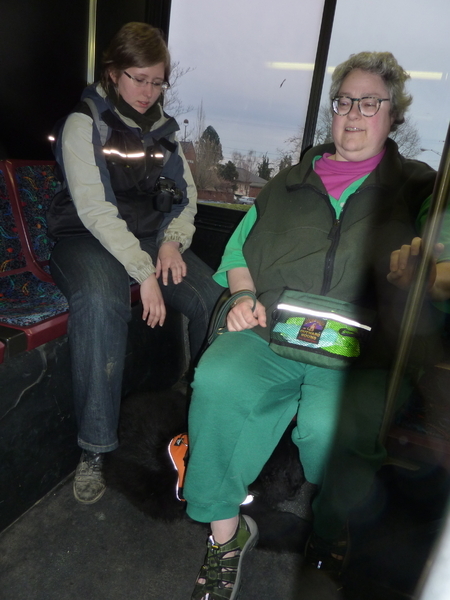 After the quick tour, we headed for a bus trip into the city to get Orka used to the public transportation system. He definitely didn't have any problems there, as he had already travelled with us all over Brussels on the tram, metro etc. So, as expected, Orka slept the whole 30 minute ride to Portland City. We stopped for a Ben and Jerry's Ice-cream, then to Starbucks coffee and finally headed back home for the night. Everyone seemed to notice his orange harness, so we didn't get too many people petting him. Very good, as he was “on duty” that night. Tuesday was planned for the Timberline mountain trip to see Bruce the working St Bernhard. Unfortunately he wasn't able to come there that day, so we just got to look and admire all the post cards and posters of Bruce. The timberline lodge was absolutely beautiful and outside there was a lot of snow for Orka to play around in. He definitely enjoyed the cold, and would have just wanted to stay outside. The views were great, but unfortunately there was quite a bit of fog, so we didn't quite see the views as we would have wanted. On our way back we stopped at the Harry & Davis chocolate shop, yummy :-) ! We also passed a Guide Dogs For The Blind -training centre. Unfortunately it was closed for visitors (open Wednesdays.. just our luck!). Wednesday was a fantastic day. We headed for the classic Newfie tour (Lewis & Clark trails) over near the coast in Astoria. We went to Cape Disappointment's interpretative centre, which was a very nice start for the day to get into the feeling of what Lewis & Clark and Seaman -newf had to experience. After that we headed for lunch (= went all the way to the coast to eat chinese food ;-) ) with Lynn's mother, and then to the Astoria Column. The views from the top were gorgeous! The views were like from a postcard / dream . Absolutely amazing.. ! Then we headed for the famous newf statue at Fort Clatsop, where Lewis & Clark and Seaman spent their winter after travelling through continental USA. Everyone welcomed us and Orka, and as Orka was a service dog in training, we were allowed to take him to see the sculpture in the museum :-). I bought a load of newfie stuff, one of the favorites was a four piece bronze set of the travellers (Lewis, Clark, Sakagewea and Seaman). Another favorite was a newfie plush toy with a collar that said “I am the greatest traveller of my species. My name is Seaman”. After the shopping and Fort Clatsop pictures we headed for a playtime at the beach. The beach was gorgeous: miles and miles of clean sandy beach! I don't think I've ever seen such a gorgeous place! Orka had a blast, though after sipping the salty seawater and tasting the foam, he was not impressed and kept barking at the waves and trying to make the foam go away :-D ! As the sun started to set, we headed for the famous newfoundland statue on the seaside. It was based on the same bronze sculpture as the one in Fort Clatsop. Thursday was a calm day for us going from dog store to another, then heading to St Helen's Columbia View Park to see a Seaman chainsaw sculpture (put up by Lynn's Indian Tribe :-) ), and finally to a huge REI store (outdoor equipment), where we bought silicone waterbowls. Amazing: they fit into any small jacket pocket, stay up by itself, light to carry and is machine washable: what more could we dream of ?! Friday was a very nervous day for me as we left early for a kayaking trip :-D and planned to go directly from there to visit two breeders. The kayaking went great (meaning I didn't fall over!) and even Orka enjoyed sitting in the kayak with Leska. Orka did have a great play in the water too :-). Nope, did NOT tip over ! After the kayaking we headed to Judi & Ellis Adler (Sweetbay), who were absolutely amazing people :-). They had very good thoughts about training and newfies, and I do hope we stay friends with them and get to share more thoughts :-). After Judi & Ellis we went for a short visit to Edie Koster (Royal Flush). We got to see some of their newfies. Then we headed for lunch and back home to pack ! Saturday we headed for the first Saturday market of the year in Portland. We went through a few of the stalls, but of course headed for the food stalls first. Ate our breakfast/lunch/brunch and for dessert got the famous Elephant Ears. The weather was very warm, as the sun was shining and there was no cloud-cover. It was a little too hot for Orka, but he loved the water fountain! Then we headed for Seattle. On our way we stopped at Horse Shoe Lake, where most of the newfie owners we met train during summertime. It was a very nice lake, and Orka loved to cool off playing and splashing around in the water. He did two gorgeous retrieves (stick) from the water back to Lynn, and did a few underwater retrieves (sunken leaves :-) ). We got to Seattle as the sun was setting, and headed straight for the Space Needle. I and Lynn went up the elevator (41 second ride) and did the tour around the outside twice. Unfortunately there weren't any boards/signs that would have explained what we were looking at :-). But well, got a fabulous view of Seattle by night :-). After that we headed for dinner and then back to my hotel. It was time to say goodbye to Orka :-( ! Sunday morning I took the shuttle bus to the airport, and got on the plane back to Brussels, connecting through Chicago. The flight went well and I got to Brussels Monday morning. After a few hours of seeing the family and unpacking, I had to again jump into the car and start driving the 10-12 hour trip towards Toulouse and my studies. Tuesday at 2 am I finally got home with Ruuti and Vera :-).